Info "Gross! Get if off! Get it off!" Shakedown is a microgame in WarioWare: Smooth Moves. It is found in Mona's stage and Jimmy T.'s. The player must shake the Wii Remote to shake off fleas (or bubbles) off of people or objects. 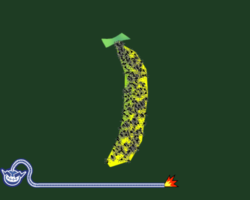 1st level difficulty: The player must shake a small amount of fleas off of a banana so a gorilla can eat it. 2nd level difficulty: The player must shake a medium amount of bubbles off of a man so a gorilla can put a shirt on him. 3rd level diffculty: The player must shake a large amount of fleas off of a robot so it can put on a metal suit. This page was last edited on February 19, 2018, at 16:41.